Lonnie Wheatley, LITTLE ROCK, Ark. (April 26, 2016) – The celebratory donuts through the infield and a jubilant victory lane celebration pretty much summed it up. 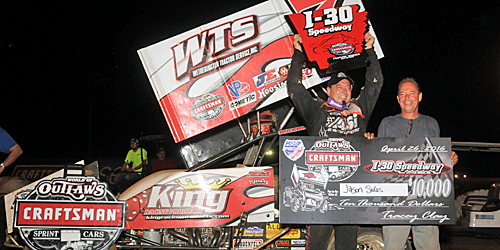 Tuesday night’s 40-lap World of Outlaws Craftsman Sprint Car Series victory in the series long-awaited return to I-30 Speedway was more than just another win for Jason Sides. 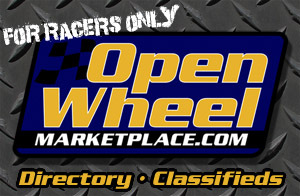 Tuesday’s card marked the first World of Outlaws event in over 20 years with the last stop in 1994. So, it was only fitting that the driver from not too far down the road in Bartlett, TN, picked off the win in front of a host of family and friends. 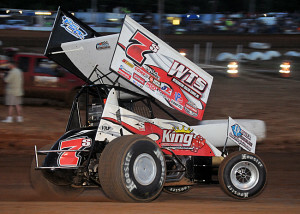 Sides put himself in position with a qualifying effort of sixth among the field of 27 and then raced to a second-place heat race finish to land in the Dash. And when the six-pill was drawn for the invert, Sides was set with the pole starting position for the Dash. Sides made the most of it, finishing second behind Brady Bacon to earn front row outside for the feature and then outdueling the past USAC Sprint Car champ in the early rounds for command before surviving several restarts along the way to lead all 40 circuits atop the high-banked, ¼-mile clay oval to take the $10,000 winner’s share. “The caution flags hurt and helped, I hated those restarts but it did keep us out of lapped traffic,” Sides explained. While Bacon held down second over the first half of the race, fellow Okie Daryn Pittman claimed the spot until David Gravel charged by both of them on the high side of turns one and two after a final caution with just 11 laps to go. Gravel nearly chased Sides down for the top step of the podium but came up short as the checkered flag flew. “I thought we had something for him, a couple more laps with those lapped cars and we could have got him,” Gravel said. Pittman filled out the podium in third with Donny Schatz and Brad Sweet rounding out the top five as Bacon slipped to sixth in the closing rounds. Quick Time: Having first competed at Little Rock’s I-30 Speedway 42 years ago, Sammy Swindell stopped the clocks at 11.835 seconds. Heat Winners (starting position in parentheses): Sammy Swindell (1), David Gravel (1), Daryn Pittman (1). Heat Moments: Caution free all the way in all three heats with the pole starter winning each one, Shane Stewart outlasted Jason Johnson early on for the final transfer from heat one with Danny Smith fending off Sam Hafertepe, Jr., for the final transfer from heat two. Dash Winner (starting position in parentheses): Jason Sides (1). Dash Moments: The only driver in the Dash field born when Sammy Swindell first competed at I-30 Speedway in 1974 (fun fact offered up by WoO announcer Johnny Gibson), Sides chased Bacon to the stripe to set the front rowe. Sides celebrated his first birthday when Swindell first slung I-30 clay while Bacon, Gravel and Sweet weren’t even yet gleams in their daddies’ eyes. “B” Main Winner (starting position in parentheses): Bryan Clauson (4). “B” Main Moments: Making a surprise appearance in the Berryman No. 31b, Cali native Carson Macedo jumped the initial start that moved Clauson to the front row outside. After Clyde Knipp flipped entering turn one on the restart, the racing action heated up with Clauson battling past Brandon Hanks (making his WoO debut) for the win with Macedo and Sam Hafertepe, Jr., mixing it up for third and Jacob Allen and Jason Johnson dicing for fifth. 10 Laps – Joe B. Miller comes to a stop and retires pitside. 14 Laps – Wayne Johnson stops and retires as well. Lap 15 Restart – Jason Johnson climbs a wheel down the backstretch and take a wild ride into turn three. 16 Laps – Mystery caution. Lap 17 Restart – On the restart, the field stacks up on the double-file restart with Hafertepe, Jr., getting the worst of it. 17 Laps – Red flag flies when sixth-runner Sammy Swindell gets over the cushion and out of shape in turns one and two, dumping it. Following a quick trip to the pit area under the open red, Swindell returns after wing replacements. 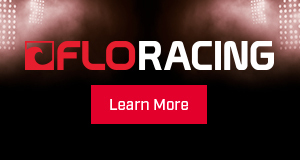 29 Laps – Final caution flies when Aaron Reutzel slows in turn four but keeps going. Reutzel exits to the pits under caution. “A” Main Hard Charger: Carson Macedo avoided trouble to climb nine positions from 22nd to 13th. Last Chance Showdown – (12 Laps – Top 6 finishers transfer to the A-feature) – 1. 17W-Bryan Clauson [-]; 2. 84-Brandon Hanks [-]; 3. 15H-Sam Hafertepe Jr [-]; 4. 31B-Carson Macedo [-]; 5. 1A-Jacob Allen [-]; 6. 41-Jason Johnson [-]; 7. 1S-Logan Schuchart [$200]; 8. 45X-Johnny Herrera [$200]; 9. 13-Clyde Knipp [$200]. A-Main – (40 Laps) – 1. 7S-Jason Sides [$10,000]; 2. 5-David Gravel [$5,500]; 3. 9-Daryn Pittman [$3,200]; 4. 15-Donny Schatz [$2,800]; 5. 49-Brad Sweet [$2,500]; 6. 99-Brady Bacon [$2,300]; 7. 29-Kerry Madsen [$2,200]; 8. 83-Joey Saldana [$2,100]; 9. 18-Ian Madsen [$2,050]; 10. 2-Shane Stewart [$2,000]; 11. 7-Paul McMahan [$1,500]; 12. 17W-Bryan Clauson [$1,200]; 13. 31B-Carson Macedo [$1,100]; 14. W20-Greg Wilson [$1,050]; 15. 20N-Hunter Schuerenberg [$1,000]; 16. 1-Sammy Swindell [$900]; 17. 4-Danny Smith [$800]; 18. 84-Brandon Hanks [$800]; 19. 87-Aaron Reutzel [$800]; 20. 15H-Sam Hafertepe Jr [$800]; 21. 41-Jason Johnson [$800]; 22. 2C-Wayne Johnson [$800]; 23. 51B-Joe B Miller [$800]; 24. 1A-Jacob Allen [$800]. Lap Leaders: Jason Sides 1-40. KSE Hard Charger Award: 31B-Carson Macedo [+9].